Rock group Foo Fighters have cancelled their headline slot at this year's Glastonbury Festival. 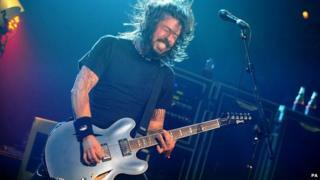 The announcement comes four days after frontman Dave Grohl fell off stage at a concert in Sweden, fracturing his leg. June dates in Belgium, and at Edinburgh's Murrayfield Stadium and London's Wembley Stadium have also been cancelled. Grohl apologised to fans, saying it was "just not physically possible" for him to perform at the moment. "Doctors have required the cancellation of the remainder of the band's dates in the UK and Europe," said a statement on the band's website. The band were two songs into their set at the Ullevi stadium last Friday, when Grohl mistimed a jump on to a ramp and fell into the gap between the stage and audience. "I think I just broke my leg," the singer told the crowd as he lay on the ground. However, the band continued the show after Grohl sought medical attention, with the singer performing in a chair with his leg bandaged. Writing on the Foo Fighters website on Tuesday night, Grohl called it "the single most bizarre Foo Fighters show in the entire 20 years of being a band. Hands down. Posting a photo of the "six metal screws in my leg", he added: "It kills me to say it [but] the doctors have told us to cancel shows. "I'm really so sorry, guys. You know I hate to do it, but I'm afraid it's just not physically possible for me at the moment. "We're doing our best right now to work out a plan, so bear with us. You know we're good for our word. But for now, I need to make sure we have years of gigs ahead of us." Glastonbury has yet to announce a replacement headliner for its Friday night line-up, but said in a statement: "We wish Dave Grohl all the best for a full and speedy recovery." It is not the first time organisers have had to make a last-minute change to the top of the bill. Gorillaz stood in for U2 in 2010, after Bono was required to undergo back surgery. Five years earlier, Basement Jaxx replaced Kylie Minogue - who was forced to pull out after being diagnosed with breast cancer. And in 1995, Pulp played a career-defining headline set after The Stone Roses' guitarist John Squire broke his collar-bone in a biking accident. Who could replace Foo Fighters? Florence and the Machine. Florence was due to perform before Foo Fighters on the Friday. She has just been number one in the UK and US with her fourth album and is one of Britain's most electrifying live performers. The time could be right for Florence to step up. Blur. Damon and co last headlined in 2009 and are big crowd pleasers who never disappoint. They are playing in Hyde Park this weekend - but are free over Glastonbury. Taylor Swift. She may not go down too well with Foo Fighters fans, but Taylor will be on a mini UK tour and has a free day on Friday 26 June. She would also not be out of place at a festival where Beyonce headlined a few years ago. AC/DC. The rock legends would be natural replacements and will be between dates on their European tour. Speaking about Glastonbury last December, guitarist Angus Young said: "If they ask… Okay." Kylie Minogue. Kylie is playing a string of UK dates this weekend. It's 10 years since she had to pull out of her headline slot. Let's finally do it. The Strokes. The US indie survivors are headlining a Hyde Park gig on Thursday and so would be match fit. Mark Ronson. Uptown Funk is the biggest single of the year so far and he is already on Friday's Other Stage bill. Read more on Glastonbury's potential new headliners. Are you going to Glastonbury? Are you disappointed Foo Fighters will not be playing? You can share your thoughts by emailing haveyoursay@bbc.co.uk. If you are available to talk to a BBC journalist, please include a contact number. Glastonbury: Who'll replace Foo Fighters?